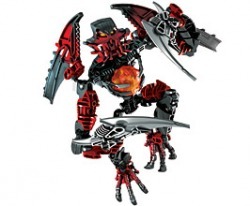 Makuta is the powerful enemy of the Toa Nuva, who schemes to keep Mata Nui asleep forever. Using his power of darkness, he turns friends into enemies and tries to rob the Matoran of their three values: unity, duty and destiny. Use the gear on his back to make Makuta turn from side to side. Includes the all-new Kanohi Kraahkan, the Mask of Shadows. Ultimate Dume was combined with Krekka, Nidhiki, and Nivawk. 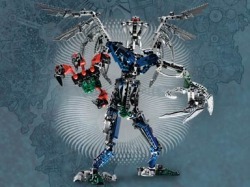 This is a very large bionicle like Kardas Dragon and Skorpio. This set is very rare infact that they only made a coulple 100,000 of these meaning that its very rare and the piece's are advanced for being the early BIONICLE year's. Icarax was created on an unknown southern island by the Great Spirit Mata Nui. The Great Spirit used the Makuta pool, and molded it into the living bodies of him and his fellow Makuta. Shortly after the construction of Destral, not long after the Makuta's creation, Icarax had an aide, Pridak, and the duo were sent with Mutran to make the Vortixx charge lower prices for their goods by Makuta Miserix. After days of negotiations, Icarax lost his temper and demolished a few buildings, which coerced the Vortixx into following their demands. Upon leaving the island, Mutran realized that he had forgotten his sentient rock, but Icarax just stated that “It’s a rock,” although it would grow into the Mountain. Sometime long before the Great Cataclysm, Mutran was sent on a diplomatic mission to Xia. When he left, he accidentally left behind his "favorite sentient rock", which he had brought with him. When he realized he had forgotten it, he figured it wouldn't be a problem and so didn't go back for it. The rock eventually started eating Vortixx and grew into the famous Sentient Mountain. Later, after the defeat of the League of Six Kingdoms, Mutran and another Makuta, Gorast, were sent to one of Kalmah's fortresses for clean-up duty. While there, Mutran discovered a carving telling how Kalmah had noticed something odd about some of Mutran's Rahi, the Blade Burrowers. It appeared that the tunnels they dug were not random, but in fact were all of the same pattern, a map. Mutran had no idea what the Burrowers were mapping or why, and was disturbed by it. Antroz is the leader of the Brotherhood of Makuta forces in Karda Nui. Aggressive, he is not really a long-range planner, more a fierce warrior. In his opinion, complex tactics and strategies don’t win battles – crushing your enemy before he crushes you wins battles. Unlike the Makuta of Metru Nui, he never underestimates a foe. Like the other two flying Makuta, Antroz spreads darkness wherever he flies. 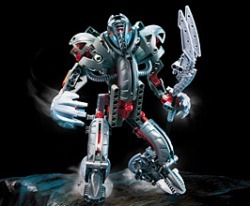 He has access to all Makuta powers, though he tends to rely more on pure physical strength in combat.